Once the moniker for a good part of South Brooklyn, today's Red Hook was cut off from Brownstone Brooklyn by the construction of the Battery Tunnel and the siting of a large public housing complex. Warehouses and other industrial building served a declining shipping industry. Red Hook's isolation--no subway goes there; a bus ride, ferry, or long walk is needed--delayed new residents and new investment. Its rugged feel and mixed-use character finally made Red Hook something of a destination, as well as a perpetual entry in the "next neighborhood" discussion. 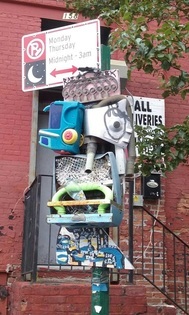 The main drag, Van Brunt Street, has become home to numerous "new Brooklyn" businesses, including restaurants and galleries. An "old Brooklyn" business like Sunny's Bar became an icon, and even the subject of a book. The giant Ikea arrived, not without controversy, as did the Fairway Market. Both today provide fantastic outdoor waterfront space, including a park that memorializes Red Hook's maritime past. Developers have floated big, often unresolved plans for remaining parcels of land. A community farm involves local youth, as does the Center for Court Innovation. But Superstorm Sandy hit the neighborhood, especially the Red Hook Houses, the 1930s housing project that contains the majority of the neighborhood's population, prompting ongoing discussions about how to best recover, and the environmentally just way to rebuild. Despite a large school-age population in public housing, the neighborhood lacks a high school, one issue that's arisen in the wake of a hugely ambitious plan, announced​ in September 2016, to build as many as 45,000 new apartments and add three subway stops. Another contested issue: the proposal to build the new BQX streetcar from Sunset Park to Astoria, through Red Hook. Two chocolate makers, one microbrewery, a winery, and a couple of distillers have launched in Red Hook. There's a great bakery and an even better place for key lime pies. Oddities abound, including a "mystery" federal facility, an under-the-radar factory making a unique foodstuff, a "robotic church," an art storage facility, and a "hidden" garden. And even Tesla located its first showroom in a corner of the neighborhood. Still, the single most compelling thing about Red Hook is simply the view from the waterfront, with views of Governor's Island, the State of Liberty, Lower Manhattan, dense Jersey City, and the Verrazano Bridge. It's even better with a taste of that key lime pie.